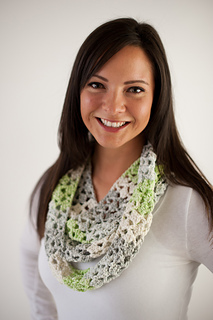 The Boardwalk Infinity Scarf is a quick and easy project with a great, openwork design. 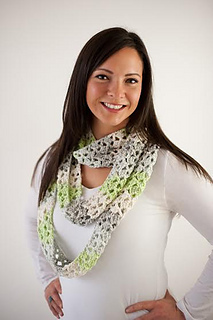 It’s a fun project for beginners and seasoned crocheters, and looks great in self-striping yarns. This is a very nice spring accessory! This pattern has been thoroughly tested, and comes with my full support. SIZES: One size fits most teens/adults. 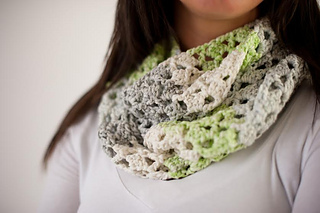 Scarf can be work double, triple, or quadruple looped! © 2015 Danyel Pink. All pattern sales are final (No refunds/returns). You may sell what you make, but please credit Danyel Pink Designs for the pattern. You may not use my photos. You may NOT resell the pattern, distribute it in any form, post it online, or alter it to claim it as your own. Contact me with any questions or for pattern support. ★ Buying 3 Patterns?? Use coupon code 3PACK for 10% off of your total purchase! ★ Buying 5 Patterns or More?? Use coupon code 5PACK for 20% off of your total purchase!